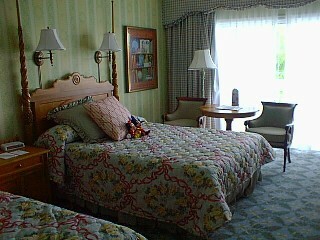 At the Grand Floridian Resort, we stayed in Boca Chica, room #8317, on the third floor with a magnificent view of the lagoon and Cinderella's Castle. This floral arrangement was in the lobby of our building. 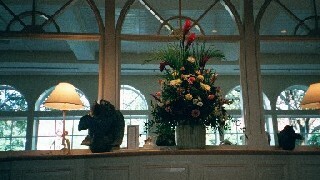 If you walked through those doors they led to the beach which was right below our balcony, overlooking the lagoon. I have my back to another set of doors which led to the courtyard and pool. 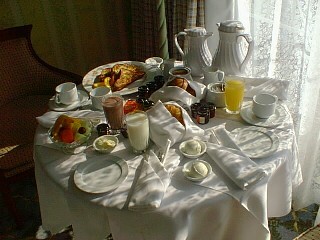 On this particular morning we ordered room service. 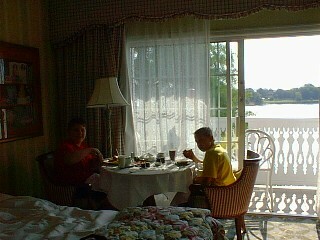 Here are Craig and Robby enjoying their breakfast with a beautiful view beyond our balcony. 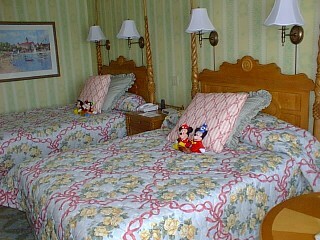 The rooms at the Grand Floridian are very pretty and have 2 queen sized beds and a daybed, which the boys found more enjoyable than having to share a bed. The daybed is the size of twin sized bed and isn't too small for an adult. According to my sons, the daybed was comfortable. We had a fantastic view off of our balcony. 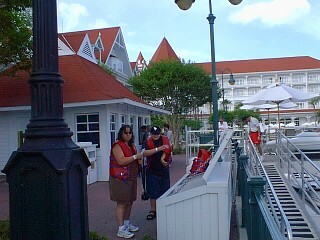 Below, you can see the Polynesian Resort in the background. Straight ahead was the Contemporary Resort and in the distance you could see a bit of the Wilderness Lodge. To the left was the Magic Kingdom and Cinderella's Castle. At night we sat out on the balcony and watched as it changed color. 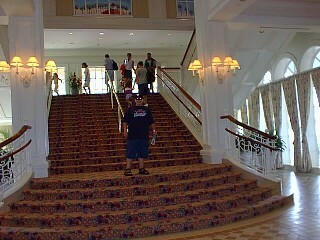 The lobby of the Grand Floridian is breathtaking with high domed stained-glassed ceilings and a grand staircase. 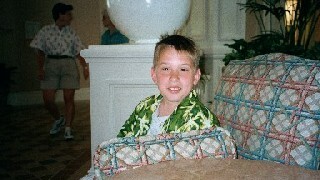 We took these shots in the Grand Floridian lobby right before going to the Afternoon Tea in the Garden View Lounge. It was the perfect way to relax after our day at Typhoon Lagoon. 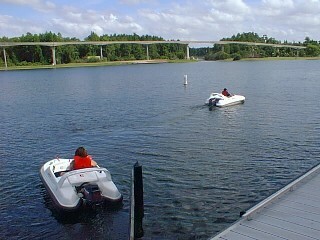 Craig and I rented water mice to race around the Seven Seas Lagoon at the Grand Floridian's marina. We had a great time and I think it was the highlight of Craig's trip. And we're off! 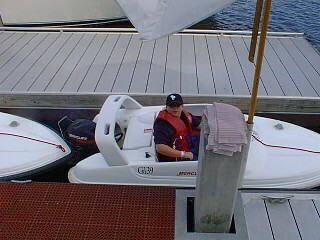 There was a "no wake" zone in the marina so we had to take it slow till we got away from the resort. After that, I couldn't catch up with Craig! In the background you can see the monorail line that leads from the resorts to the Magic Kingdom.